CEOs work long hours, filling their days with meetings that start before dawn and extend well into the evening. T-Mobile CEO John Legere is no different. Except he spends practically every spare moment on social media -- particularly Twitter and its live video cousin Periscope. 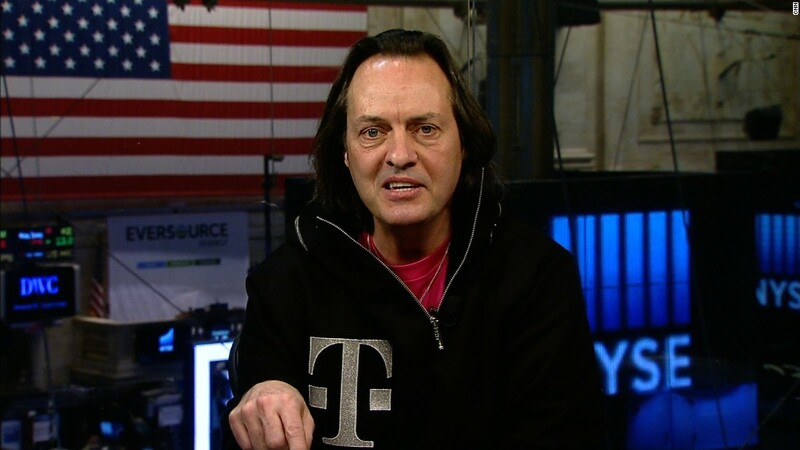 "It's something I'm doing every minute of the day," Legere told CNNMoney. "It's all I do. When I sit alone at a bar, I do Twitter. Maybe that's a little sad. But my peer CEOs would never do it, because it's way too hard and very unglamorous." Legere is a Twitter (TWTR) rock star. He has amassed more than 2 million followers, and he has sent more than 17,500 tweets since he joined in May 2013. He tweets about running, cooking, grocery shopping, and he has gotten into a nasty battle with Donald Trump. But he is best known for interacting directly with T-Mobile's customers. He's the rarest of chief executives: He runs the nation's third largest wireless carrier, and yet he's one of the company's go-to customer service agents. Impressed by his innovative use of social media, Twitter has decided to give Legere his own emoji. 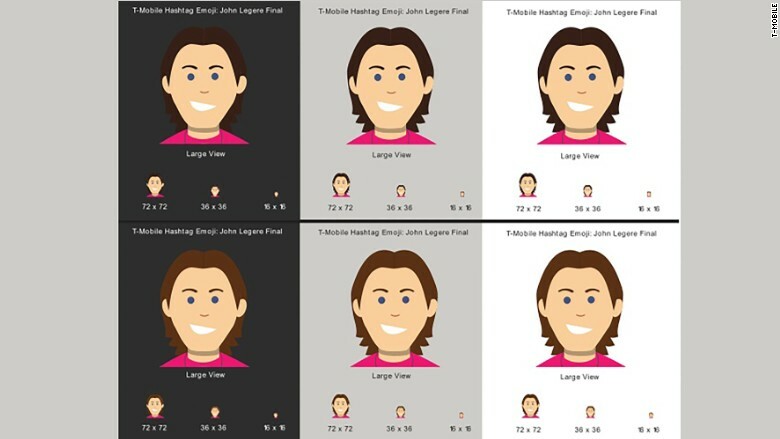 Starting Monday, when people tweet with the hashtag #tweetjohn, a grinning Legere emoji will show up next to the hashtag. Legere is only the second person to be given a dedicated emoji by Twitter. The first was Pope Francis. "I'm going to take some ribbing from my friends," Legere said of the emoji. "But it definitely makes me look 20 years younger." Despite the humility, Legere is clearly proud of the achievement. On Sunday, he tweeted out several photos of himself wearing a magenta sweatshirt with his emoji printed on the front. Legere credits his devotion to social media as one of the catalysts for T-Mobile's (TMUS) remarkable turnaround over the past few years. He says that he implemented several ideas that people pitched to him on social media, including the 'Data Stash" monthly rollover program and the "Binge On" unlimited video deal. "I have a much more precise pulse on what's happening, even with individual customers," Legere said. "I'll have an interaction with an anonymous person, and their mind is blown that I'm handling this issue." On Twitter, every conversation is public. So it's not just that one particular customer who walks away with a positive view of T-Mobile. Thousands of other people who watch the interaction see what makes Legere -- and T-Mobile -- different from the competition. Legere is certainly different. He curses during press events, wears magenta every day of the week and is unafraid to say what he really thinks about his rivals. Many have dismissed Legere as a buffoon or a walking, talking marketing scheme. But Legere insists his demeanor is sincere. He said he runs his company internally the way he presents himself externally, with an inclusive strategy. His strategy wasn't exactly met with open arms when he took over as CEO in September 2012. "I ran into corporate structures and HR and legal who said, 'That's a nice idea, Mr. CEO, but you can't do that,'" Legere said. "I just asked, 'why, why, why,' until they ran out of explanations." Now, he says his eccentricities have been embraced by his coworkers, including the suits. There have been a few times where the legal department has paid him a visit, and he's received some frowns from executives at Deutsche Telekom (which still owns two-thirds of T-Mobile USA). But Legere insists that his tweets aren't cleared with anybody. In fact, when he started posting to Twitter in 2013 (at the suggestion of his daughter), he didn't let anyone else at the company know -- and security alerted Legere that someone was impersonating him. He says the CEOs of rival wireless carriers are "way too serious" to do what he does. "I have chosen to have this life that no one wants a part of," Legere said. "But if you're going to do it's gotta be real. If you're not, people vote you off the island. If they think someone's posting for you, they're not interested."